Land Rover Defender is one of the world's truly iconic vehicles, epitomising toughness, versatility and go-anywhere capability. It carries the genes of the first Land Rover of 1948 yet, in its latest form, employs the very best of today's automotive technology. Like those first Land Rovers produced amid the harsh austerity of post-war Britain, the Defender has always been built to do a job of work. In short, it's a vehicle with a mission. Since the original incarnation of Defender first hit our roads in 1983, it has become ever more popular as a machine for everyday use. Comfort levels have grown, performance has improved and refinement has reached new levels, yet one crucial aspect has not changed — the Defender remains the world's best off-road vehicle. Defenders earn their keep on farms and construction sites and are an essential tool among utility companies and forestry organisations. The same basic vehicle is a school run bus, weekend shopping car and commuting hack. The Defender is the central core of the massive Land Rover enthusiast movement, with like-minded devotees using the off-road capability to the full on weekend expeditions, and gathering together for shows and other events throughout the year. 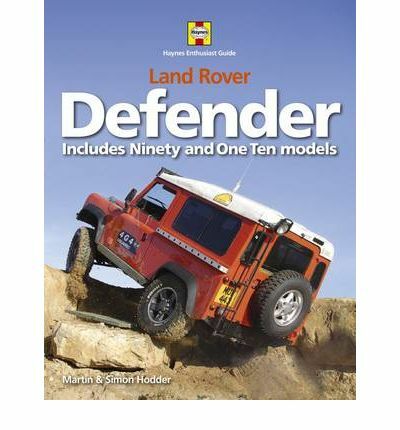 This book explains and celebrates this multi-faceted appeal, with informative words and compelling images covering all aspects of the Defender. Martin and Simon Hodder are a father-and-son team with a passion for all things Land Rover, and their enthusiasm creates a book that is fascinating and compelling, yet informative and authoritative.